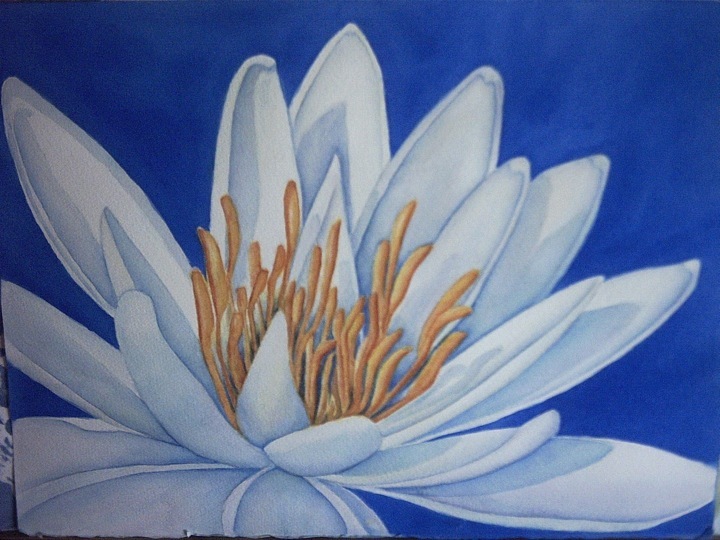 "Bourgeon de Lys Asiatique Orange"
This painting was part of a campaign to save some wild island beach from developers, and happily, it worked. 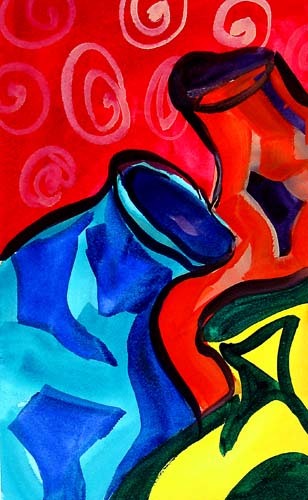 I used a size 12 Loew-Cornell cheap brush on the shells, which worked beautifully; my photography skills are not too slick, so this is a detail of the finished piece. 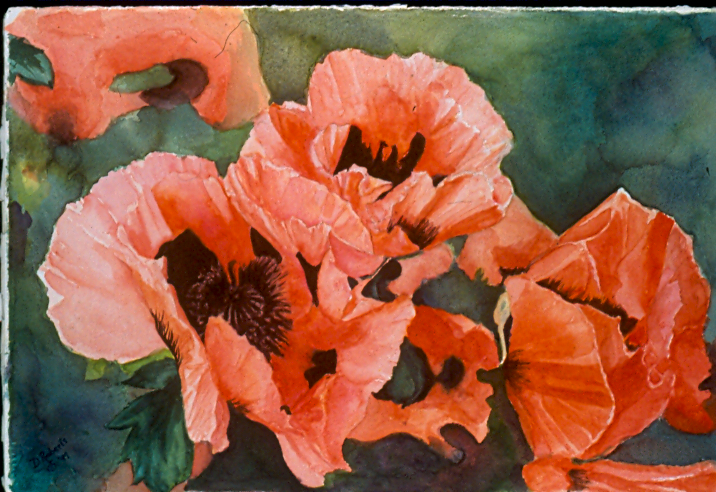 While on a wc painting trip in Scotland, I saw these amazingly large salmon-colored poppies everywhere. I just had to take close-up photos. Cranstina is the fiance of my grandson's friend. I took the source photo at their graduation from college. She is a very interesting young woman. 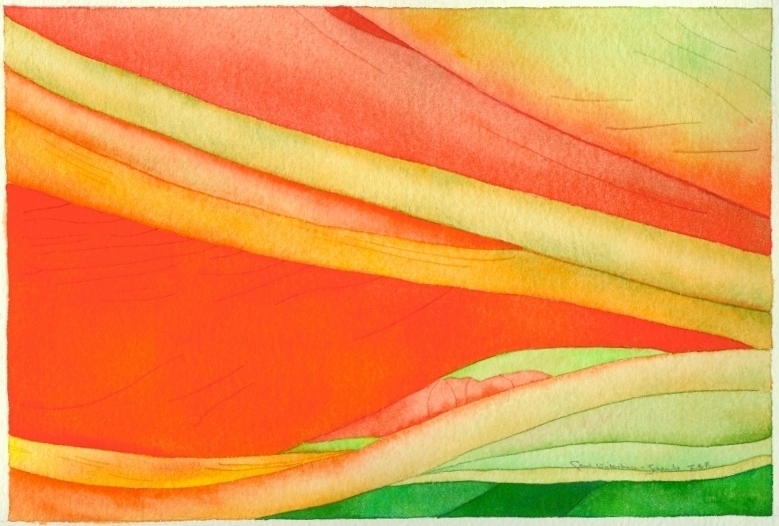 This is a design sketch based on a realistic watercolor, playing with color and distortion. 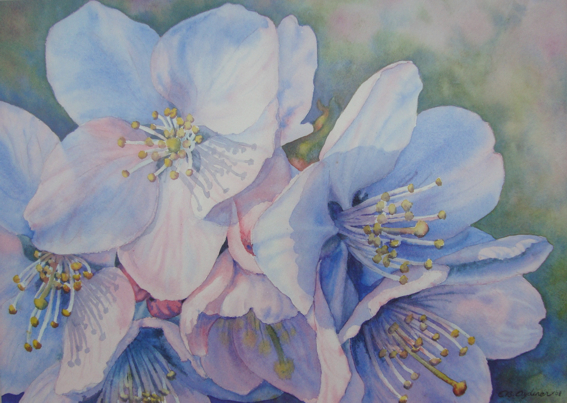 This painting was done after a trip to our beautiful Botanical Garden in Montreal. I took over 350 photos on my digital camera and I always try to go a couple of times a year. It is a pleasure for the eyes and all our senses to visit this place. I wanted to show the delicate beauty of this flower up close and personal. I love it when my apple tree blooms in spring - it's a big old tree that fills up most of my window. Hardly a year goes by that I don't immortalize a blossom or two. Just something out of the ordinary for me. Enjoyed it! Wondering about placing something between the two shells in upper left or not? Ideas? Thanks for the opportunity! 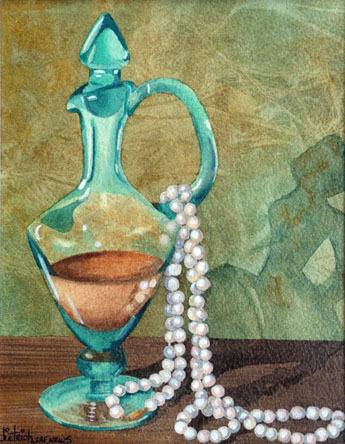 "Le collier de perles / Pearl necklace"
No glass watercolor (varnished) on Waterford 200 lb c.p. I thought that it would be nice to add a pearl necklace to this this glass perfume bottle. 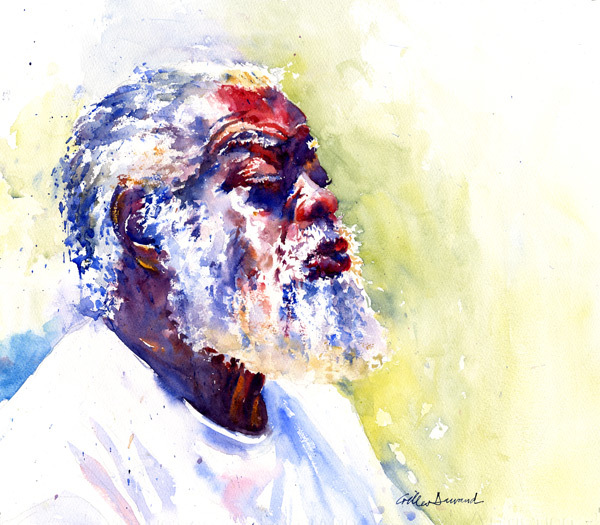 I like to paint from life, with the subject in front of me. Painted on site at the memorial gardens in Orange County Park, NY. These are planted to replace fall flowers as they remain colorful until the snow comes. 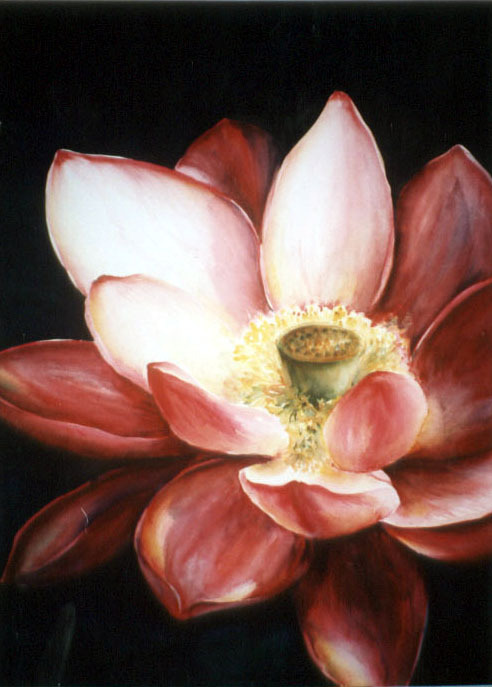 A peek into the inner sanctum of a fully opened red lotus... it gave me a feeling of the passion hidden within a bloom more known for its serenity. 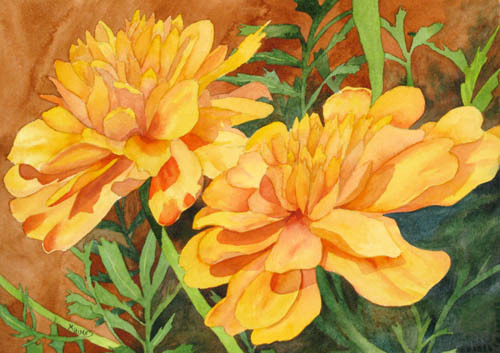 One of my painting buddies had a pot of marigolds on her patio, and their bright yellow faces just called out to me. 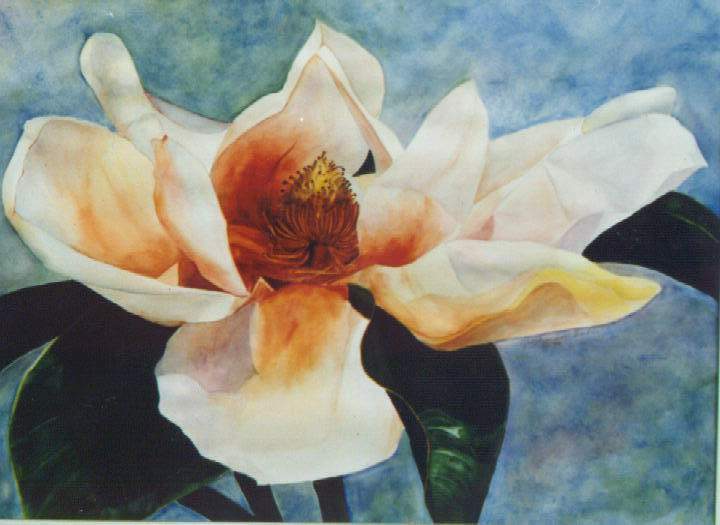 Once I had a magnolia tree in my back yard. 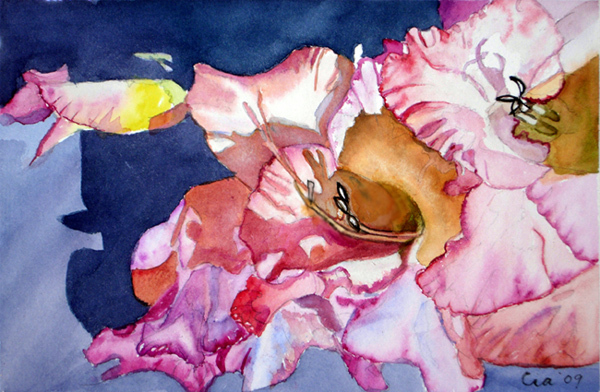 After I painted this last flower, the tree died. 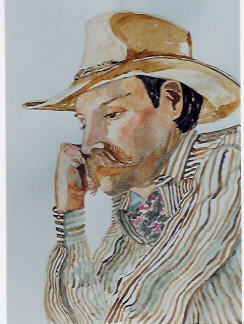 This was my very first painting of a large scale. 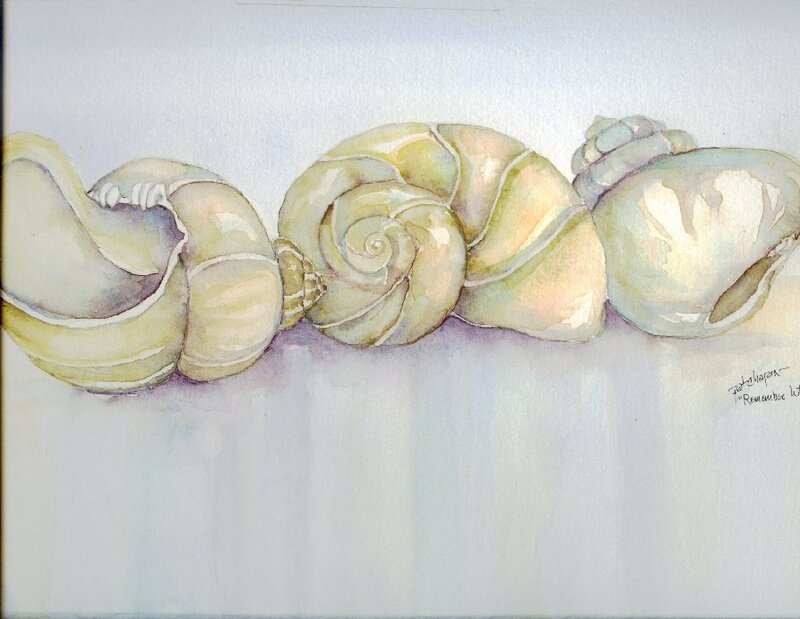 This is a small study of shiny objects that I did with my painting group. 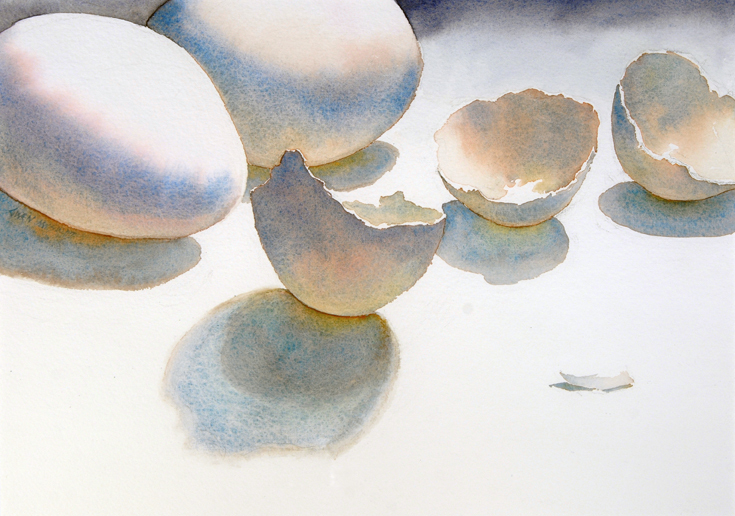 One of a long series of egg and shell studies in transparent watercolor. 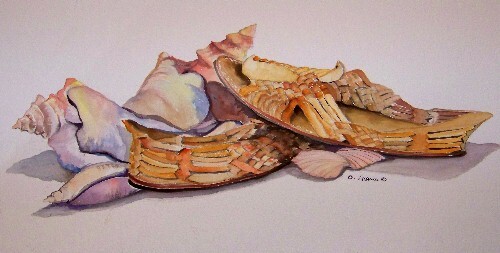 My watercolor instructor many years ago had the class paint egg shells as an introduction to the media. I soon realized what a valuable lesson it was and have my beginners paint eggs and shells to this day. 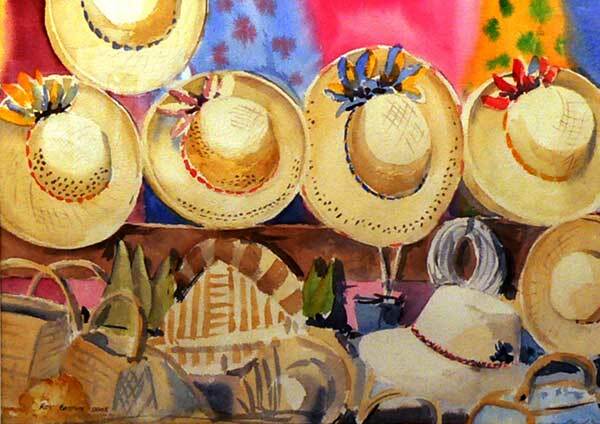 Wandering around the market in Papeete, while on holiday in Tahiti, I was fascinated by the colourful range of hats and scarves on many of the stalls. A great spot for watercolour. I thought the geometric shapes of my neighbor's deck made a nice contrast to the organic flower shapes. 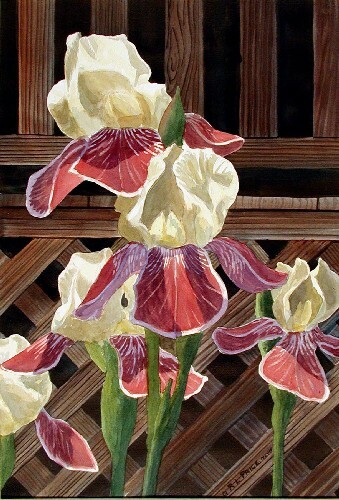 I masked out the flowers before painting the latticework. 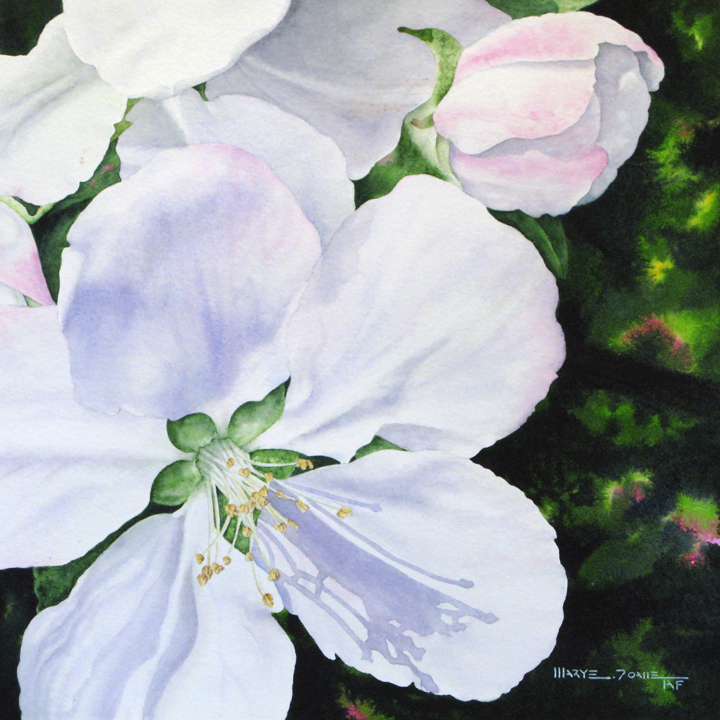 It was a fun painting to work on - one of my few flower paintings. Although this turned out more cartoonish than I intended, it does show that curiosity is an equine's middle name. Needing to know what you're doing brings them right in your face. When I told Malik I might do a painting from this photo I took of him in Venice Beach, he answered that the question was not if I would do a painting, but when... It took me 4 years to dare confront his powerfull personality! 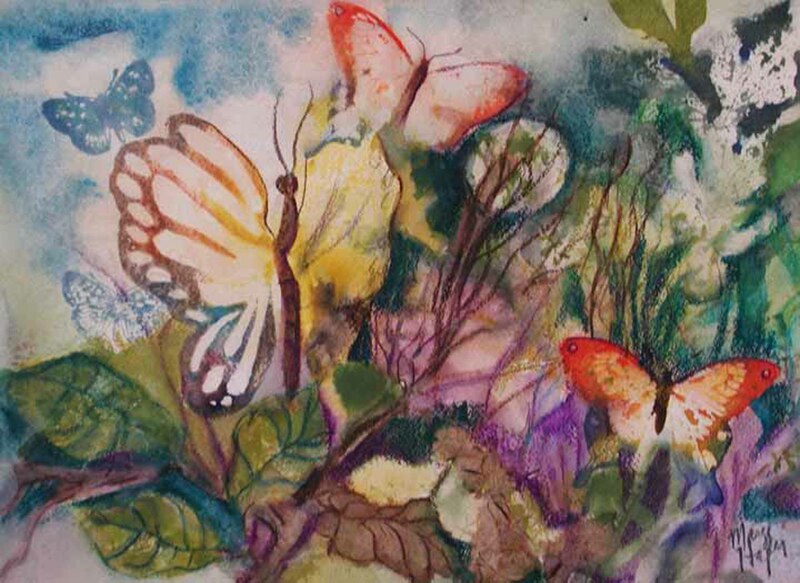 A fantasy garden using rice fiber paper collage, and stamping techniques with watercolor paint. 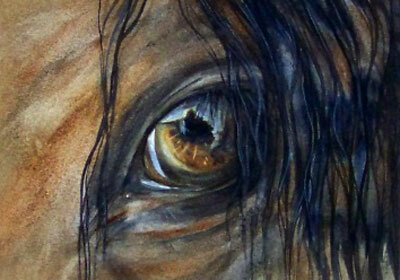 "Equine eye of the beholder"
The eyes are the heart and soul of the animal so I feel are the most important part of the painting and must be well done or the painting doesn't "speak". 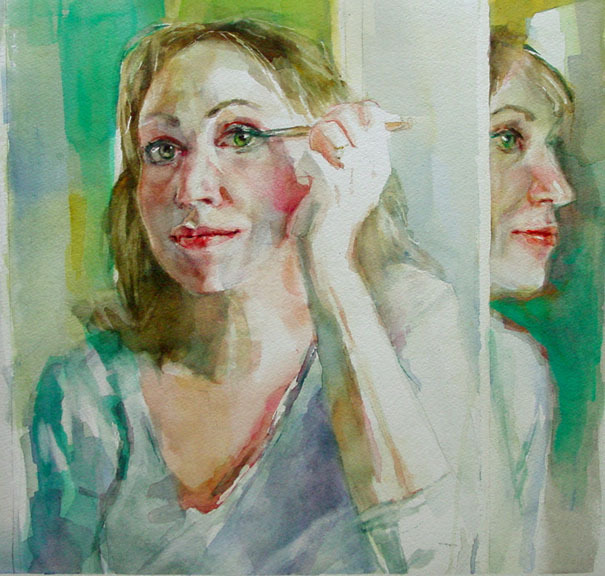 I liked the idea of painting myself as I painted myself. 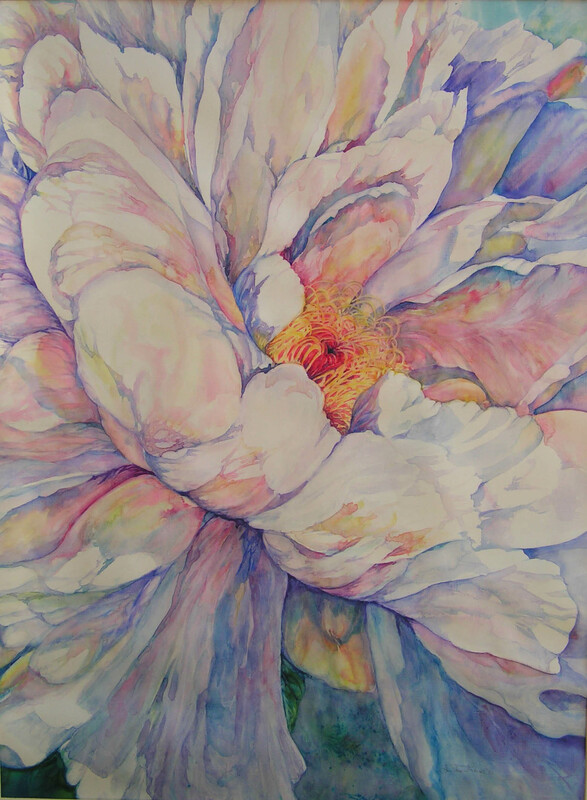 This is a close up painting of one of my Tree Peonys, it is very large, almost completely white, with a little pink, and almost always the first peony to bloom in my garden. 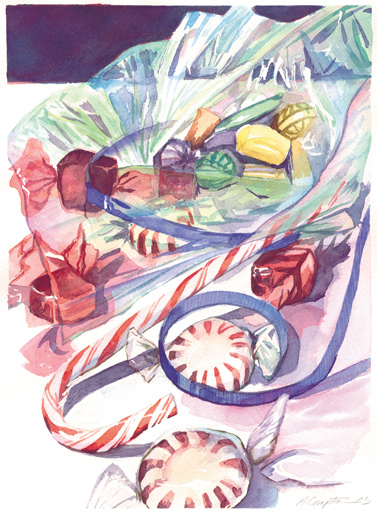 I wanted to try to paint cellophane. It ended up being my Christmas card in 2003 which was fun. 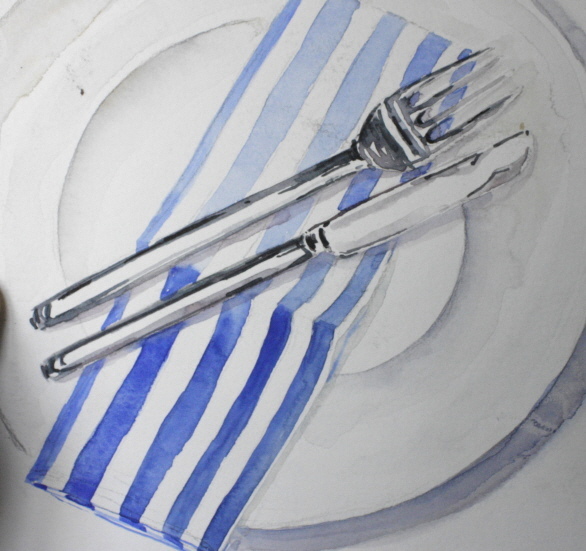 I was glad to go back and find this for the subject of "Close-ups" and may do some more of these after I'm finished preparing for a show of my oils on big skies and under ground dwellings–the complete opposite of a close-up! 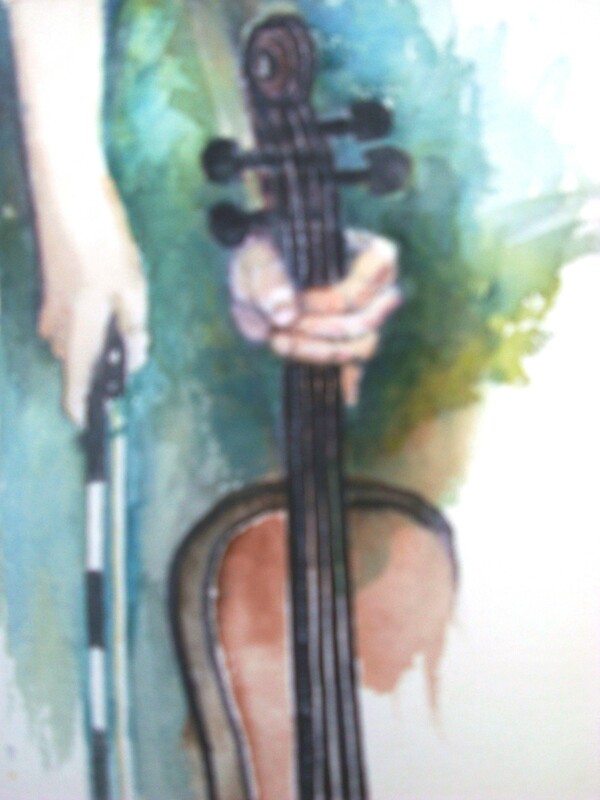 "Watercolor of Kilee's hands with Violin & Bow"
A closeup of Kilee's hands in watercolor which is much more difficult than I anticipated. 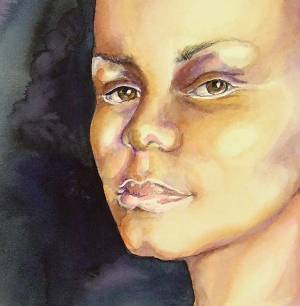 This study was necessary in order to complete a full figure portrait of the girl. When I saw this beautiful waterlily in my garden pond, I just knew I had found my subject for "close-ups". 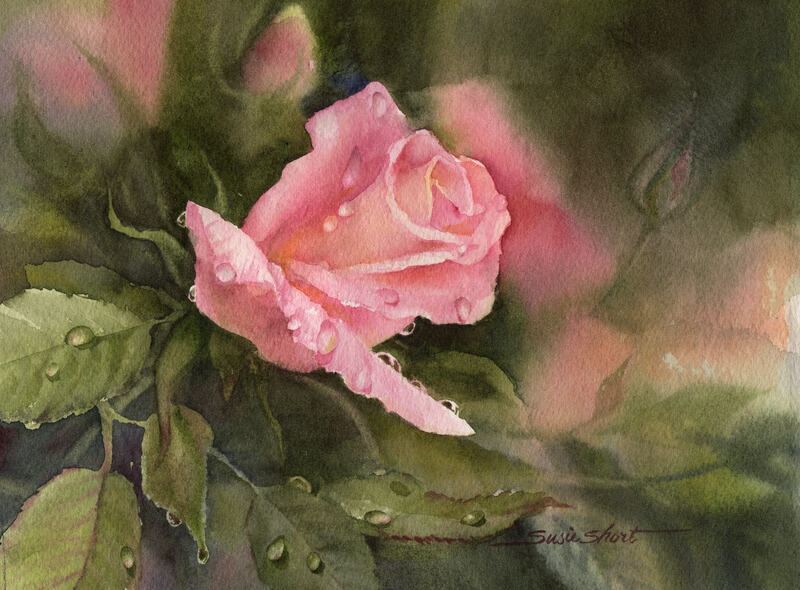 It was so calm and cool that morning, that I did most of the painting out in the garden.